You will be criticized in life – no matter what you do. That is a fact! As a writer, an artist, a designer, a chef, an executive, child or parent, it doesn’t matter. Regardless of your career path or other roles in life, there will always be critics. Because of that, it is important to learn how to respond to criticism, rather than react. 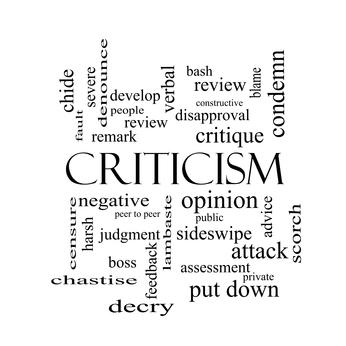 It is possible that receiving criticism gracefully may not be one of your strengths. In fact, you may be among those who are easily offended by criticism. If so, it may be hurting you professionally and ultimately it may prevent you from developing as a person. When people are upset, the tendency for most is to react to the situation – in fact, they often overreact. Have you ever considered the alternative? Which is: choose a response instead of immediately reacting. In order to be successful at this when you are criticized, you must learn to stop – breathe – think about what has been said and choose an appropriate response. What? Why is that important? Easy answer . . . when you really love what you do, your work reflects your feelings. When you are passionate about what you do, you are always looking for ways to do it better and are generally more open to criticism. In fact, your desire to improve may give you the perspective to view criticism as feedback (information that you can use positively, or ignore). However, when your work just a job that pays the bills, you are more likely to be defensive and it will be much harder to take criticism well. You should dedicate your precious hours in life ONLY to something that you truly believe in. If you are dedicated and have strong convictions about what you do, criticism of your work will only make you stronger, rather than devastate or discourage you. You will also be more likely to receive criticism graciously, and have the ability to talk about the other person’s opinion to see if there is something of value that you can use. Always look for the positive in everything! If you can train yourself to listen carefully to what is being said when someone is criticizing you, and accept it as feedback only, it will be easier to find the positive aspects of it, regardless of who is speaking. You can simply say, “Thank you for the feedback,” and then, take the time to think about it and decide what you want to do with it. Feedback is nothing more than someone else’s opinion. It is information that you can listen to and choose to use, or not. There may be positive nuggets that will help you be more effective or better at what you do. If so, you can choose to implement the suggestions. OR – if there is nothing useful or helpful, let it go and move on. The reality of life is that no matter what you do, you will be criticized by people in all facets of your life from time to time. But, if you can integrate these three very simple tenets into your life, criticism will no longer have a negative effect on you. You will be better equipped to stop, breathe, listen to what is being said, and respond in an appropriate manner. You will no longer feel the need to react with angry, defensive words or actions. In time, when you learn to respond graciously to criticism, rather than react, you may actually welcome it. Sounds crazy, I know. But – it can change your life. This is a great choice for a New Year’s Resolution!